Your step-by-step guide to getting started with FMOD Studio in a weekend. FMOD In A Weekend is a course designed to get you started with FMOD Studio in just 2-3 days! In detailed, over the shoulder tutorial videos, Guy and award-winning sound designer Andy Gibson take you from the basics to the essential functions of one of the industry’s leading audio middleware solutions. We’ll show you how to set up your events for implementation and understand how sound designers create unique and dynamic assets, from simple one shots to powerful transitions. You will also receive a comprehensive course text, which expands upon every point Guy and Andy cover, including detailed explanations and annotated examples. If that wasn’t enough, there’s also a forum where you can share ideas and take part in discussions with your classmates. Study within our online campus using our revolutionary Course Reader. Hours of over-the-shoulder videos that reveal the tricks of the trade when it comes to working on video games using middleware. Technical support available via the online support tickets. Join our dedicated community forum to share your ideas and discoveries. Enrol Now – The comprehensive guide to getting started with an industry standard middleware! • You’ll learn how to get up and running inside one of the leading industry audio middleware programs. We’ll get you familiar with the interface, working with multisounds, scatterer sounds and parameters, using mixer snapshots and the profiler; Everything you need to know! • Learning on your own can be a daunting task, but with our comprehensive video guide, as well as the in-depth course text, you can get up and running in just one weekend (maybe even less!). • Hear from Industry guru Andy Gibson as he discusses the varying challenges you’ll have to overcome when working with middleware and the wider game audio industry. If this is your first endeavour into game audio, we’ll run you through the ins and outs of what a piece of middleware is and the situation you will use it in. Starting from the basics, we’ll run you through the interface and how to navigate around FMOD Studio. An introduction to the uses of and differences between events, banks and assets. Getting started with triggering your assets in new and creative ways. We’ll run through the basics of FMOD’s multisounds and scatterer sounds. A look into the function of parameters in FMOD and what they mean for you as a middleware user. How to take a simple loop and add variance for playback. Using FMOD’s automation tools to manipulate your events. Learn how to use FMOD’s transitions feature, the key to creating dynamic adaptive music in games. A look into the purpose and function of FMOD’s Snapshot feature. Learn how to dynamically change the mixer according to events in the game! Through a Unity example, start to understand how audio designers and QA specialists check audio work inside the game engine. Andy Gibson is an Audio Lead/Director with experience working with huge AAA projects. With FMOD certification, Andy’s day-to-day duties include creating sound effects, recording voice actors and communicating with composers, with experiences working on titles like Drakensang, Sniper Ghost Warrior 3 and MotoGP. Andy also had some of his recordings featured on films such as Dredd. “Andy had just finished doing the painful transition from FMOD Designer to FMOD Studio as a middleware while this MMO was live without any interruption; during that time he still managed to support a huge content update with lots of new audio. $99 – Low cost single payment! 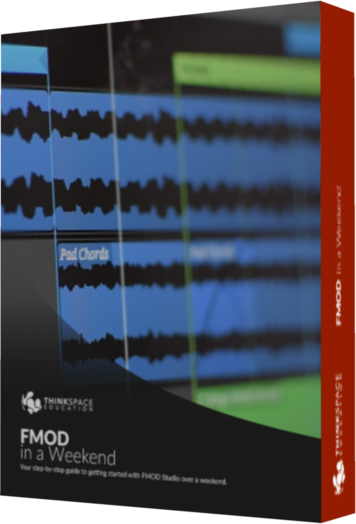 You don’t need to be a master composer or sound designer to take this course, just some way of putting your own audio assets into FMOD to help contextualise what you are learning. FMOD Studio can be downloaded for free from the developer’s website: http://www.fmod.com/. You don’t need any specific hardware to actually take the course except a computer that is able to view webpages via a browser. The video material totals at just under 4 hours, however you can watch them in any order you like. It’s designed to be viewed over a weekend, however you can view it in whatever sitting suits you best. The materials for this course are not downloadable, and are only available online through our new Course Reader.